A high-quality cookware set or individual piece made from durable materials and a hardy construction will last you a lifetime. Sometimes the best route is to pay a high price once and never have to buy another cookware set, pot or pan for decades to come. This is far preferable to paying a small sum for a cheap set and having to replace it every couple of years when it wears out and become useless to you. If you’re searching for new cookware to take you through the decades we’ve got a great review here for you today: the All-Clad MC2 range (MC = Master Chef). 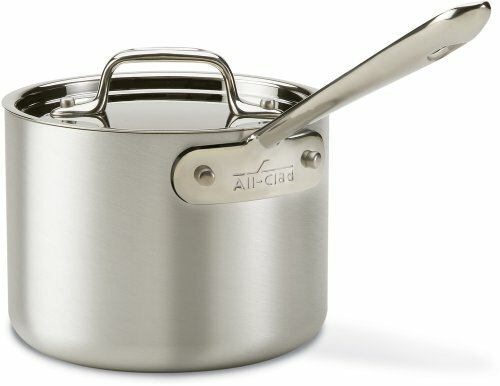 All-Clad is an American-made brand which uses a bonding/cladding technique to create hard-wearing metal cookware items which perform excellently. They layer their metals (stainless steel and aluminum) for the best heat conductivity and even heating throughout the whole pot or pan (up the sides) as opposed to simply adding a heat conducting layer on the bottom. The MC2 range is characterized by 3 metal layers: stainless steel outer, aluminum core, stainless steel interior. The 18/10 stainless steel interior is safe as it is non-reactive and won’t cause leaching from acidic foods. The handles are long, comfy to use and strongly riveted for durability. Tempted already? There are many other fantastic features to learn about! 15.2 Is all clad MC2 oven safe? First up is a cookware set for all of you out there who need a whole kitchen revamp or new cookware to bring to a new home. This is an edited yet very thorough collection with one of each cookware essential. You could use this set as your core collection and add an individual piece here and there as your family grows or your cooking adventures become more advanced. For a couple or a small family, you wouldn’t need anything else but what this collection offers. Like all MC2 pieces, this set offers amazing heat conductivity and even heating thanks to the aluminum core which extends throughout the entire piece, not just along the bottom. The stainless steel interior is stick-resistant and will develop into a non-stick surface with proper seasoning and cleaning (handwash despite the “dishwasher safe” label!). We love the contrast between the brushed stainless steel exterior and the high-shine lids, it just adds a little extra style flair. 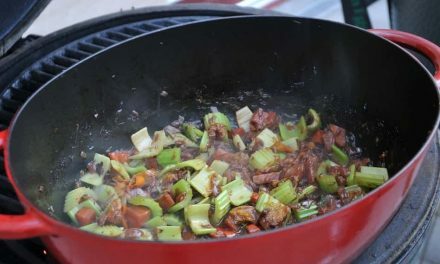 Speaking of the lids, they are very tightly-fitted to the rim of the cookware to seal in moisture, heat and nutrients. Each lid has a strong, riveted handle large enough to get a sturdy grip. The handles on each piece are long, contoured and have a hole on the end so they can be hooked for storage if that’s your storage preference. They’re designed to be comfortable to hold, with a safe, strong grip. The saute pan and stock pot both have “helper handles” so you can lift with two hands and transfer safely from stove to oven to storage. You can use each and every item in this set in the oven up to 500 degrees Fahrenheit. This should be expected from an expensive, high-end set as it means your cooking options are wide open. Broiling, slow cooking, keeping warm and roasting in the oven, as well as good old stovetop cooking methods, are all within your reach. Do note that the MC2 range is not induction compatible, (suitable for gas, ceramic, electric and halogen). We think this is a wise choice if you’re looking for a high-quality cookware set with a carefully curated collection of items. It’s got everything you need, but it’s not so large and complicated that you have to completely rethink your kitchen storage. If you require a cookware set which can be used on the stove and in the oven, add this to your shortlist. Ideal for starting afresh, perhaps in a new home or simply overhauling your old existing cookware. The All-Clad MC2 12-inch fry pan is a fantastic kitchen staple for large portions of meat and veggies thanks to the wide cooking surface area. The edges have the characteristic MC2 feature of being curved for easy, mess-free pouring. 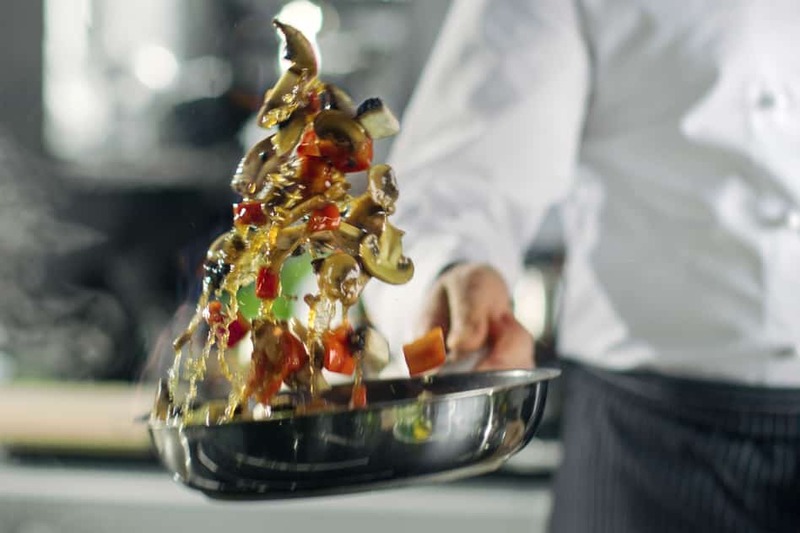 We love this because it means you can pour the leftover juices and sauces straight from the pan onto the plate. True to form, the construction is made of 3 layers: brushed stainless steel outer, full aluminum core and a shiny stainless steel interior. 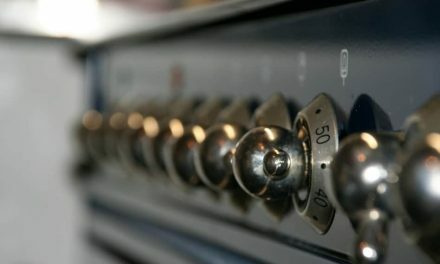 The handle is long, contoured and designed to remain cool to touch when on the stove (gas, electric, ceramic, halogen). And yup, you can pop this pan into the oven up to 600 degrees F with no risk of leaching metals or chipping surfaces (the joys of stainless steel!). You can’t really go wrong with this frying pan if you’re after an extremely durable, hardy, oven-safe frying pan for everyday usage. It’s not non-stick, but with proper technique (i.e. no cold foods on hot pan) and gentle cleaning you can achieve a stick-resistant finish. It’s expensive for one pan, but you’ll save money in the long run as you won’t need to replace it! If you often find yourself cooking pancakes, fish, eggs or silken tofu, you’ll need a reliable non-stick pan to make the process smooth and frustration-free. This pan combines the MC2 construction (stainless steel, aluminum, stainless steel) for even heat distribution, with a non-stick cooking surface added. The sloped sides and curved edges are great for easily slipping an omelet onto a plate or flipping a piece of fish. The handle is exactly as we expect from the MC2 range: long, contoured, comfortable, and heat-fighting for safe handling. As far as non-stick pans go, this one is one of the best. You get the best of both worlds: 3-ply design for thorough and even heat distribution as well as a high-quality non-stick surface. The oven-safe design makes for a versatile piece of cookware you can put to many uses, day after day. Remember to only hand wash this pan to keep the non-stick surface strong and intact. A saute pan really is a necessity for any home cook. You can cook larger items such as thick pieces of chicken or beef, without worrying about splattering or spillage as you might with a shallow frying pan. You can add liquids and create sauces and stew-like textures easily without overfilling. The All-Clad MC2 3-quart saute pan has the brushed stainless steel exterior, heat-conducting aluminum core and stainless steel interior we need for even and reliable heat distribution. We love the helper handle opposite the long handle as it means we can get a strong, balanced grip on the pan when transferring it from oven to stove with hot food and liquid inside. While it doesn’t have a non-stick coating, it can be stick-resistant if you preheat it properly and use room-temperature food. By gently hand washing, you can preserve the oily cooking surface to create a light seasoning. We love the tight-fitting lid as you can cover your food as it simmers away, locking moisture and heat in. We recommend this saute pan for anyone who’s in the market for a long-lasting, attractive saute pan with deep, straight sides for spill-free, spatter-free cooking. Make saucy meat dishes or simply pan sear fish without spitting butter all over the stove. Use on the stove (not induction compatible) or in the oven, and give a quick hand wash before hanging up to store using the hole on the end of the main handle. Easy, attractive, durable and versatile. We all need a classic saucepan, complete with a lid and handle. Stovetop oatmeal, sauces, gravies…it’s all best made in a deep-sided saucepan with an even heat distribution. 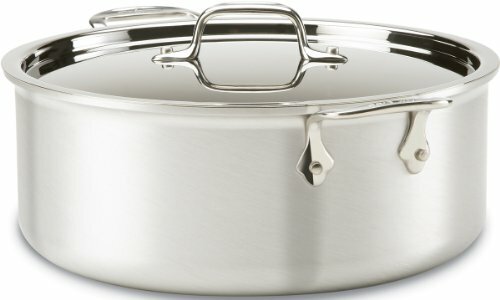 The All-Clad MC2 2-quart saucepan is expensive for a solo piece, but the quality of materials (stainless steel and aluminum of course) and durability makes it all work it. One great saucepan at a high cost which lasts forever is better than buying a cheap, flimsy one every couple of years. The long, contoured handle is angled upward for easy handling and maneuvering of the pan. The lid is tight-fitting onto the pan so you can lock heat, moisture and nutrients into the pan when simmering and keeping food warm. Comfortable lid and stay-cool pan handles riveted for strength. If you’re in the market for a very high-quality saucepan which will be a part of your kitchen collection forever, this is a perfect choice. If you’re prepared to stick to hand washing and you love the silver aesthetic of stainless steel, there’s no better saucepan than this one. You could pair it with the 3.5-quart saucepan for a variety of sizes. If you regularly make soups, stocks, bubbling chili or soft, braised meats, you really need a stockpot. What’s more, you need one which will hold up in the oven as well as on the stove. The All-Clad M2 8-quart Stockpot is a fabulous choice for this purpose if your budget can extend to a high-end product which will last forever. The layered stainless steel and aluminum ensure the heat spreads evenly throughout the pot so you don’t get hot spots and uneven cooking. The edge is curved for easy pouring, and the lid slots tightly into the contours of the edge to keep all that moisture and flavor locked in tight. The two loop handles on opposing sides are riveted firmly to the pan and are designed to allow the user to get a firm grip when carrying heavy, hot dishes to and from the oven and stove. We think this is a fine choice for a long-lasting stock pot with both stove (everything except induction) and oven suitability. If you’ve got a high budget set in place for a high-quality stock pot to use for decades, this one is perfect. As a wedding gift or new home gift, this could be a real stunner for a loved one who loves cooking and needs shiny new cookware. This pan is ideal for sauteing, frying and steaming foods quickly and easily. The high sides and wide mouth is characteristic of a classic chef’s pan. This is so that liquids can evaporate more efficiently which is needed for stir-fries and sauteed foods. The round, domed lid comes in handy when you want to lock the moisture in, for steaming and locking juices into meats. It’s similar to a wok, with tall, curved sides ideal for tossing and quickly moving food around the pan. Like the entire MC2 range, the Chef’s Pan has a brushed silver exterior with a high-shine silver lid. And of course, the main handle is long, contoured, comfortable to hold and resists heat. There is also a helper handle on the opposite side of the main handle which makes it easy for the user to safely lift the pan when there is heavy, hot food inside. 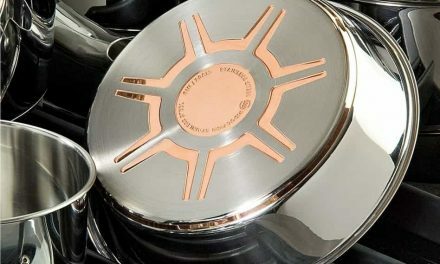 As you would expect from the MC2 range, the Chef’s Pan is oven safe and should be hand washed for the best maintenance. While this isn’t a staple or necessity in a basic kitchen collection, it would come in very handy for active, keen home cooks. The lid is quite high, so it pays to consider storage availability before making the choice. 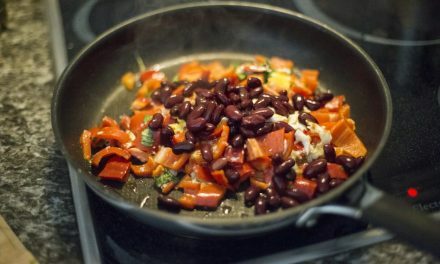 If stir-fries and sauteed dishes are a regular part of your weekly home menu, as well as steamed veggies, then this could be a better choice than a regular frying pan. The shiny, lustrous silver construction and stylish shape could make for a thoughtful and practical gift for a home cook. After studying the All-Clad MC2 cookware range, we think it’s worthy of putting at the top of your list for a new cookware set or an individual piece. It’s not as expensive as the D5 range or the Copper Core range, but it still offers the durability, heat conductivity and aesthetics we expect from All-Clad. If you need cookware which is oven safe, easy to hand wash and comes with tight-fitting lids, definitely take a deeper look at the MC2 range. However, if you have an induction cooktop, keep looking as this set is only suited to gas, ceramic, electric and halogen cooktops. One thing you can be confident about is the durability of the All-Clad MC2 range. There are no coatings or glazes so there’s no risk of peeling or chipping. The cooking surface is made from 18/10 stainless steel so you won’t encounter leaching. The handles are riveted to the pans so you won’t experience wobbly or unstable handles over time. The 3-ply construction with 3 metal layers means you won’t come across that awful warping and uneven cooking surface you can encounter with flimsier cookware (but be sure to let the pan cool before washing, just to be safe). We give the All-Clad MC2 range two thumbs up! 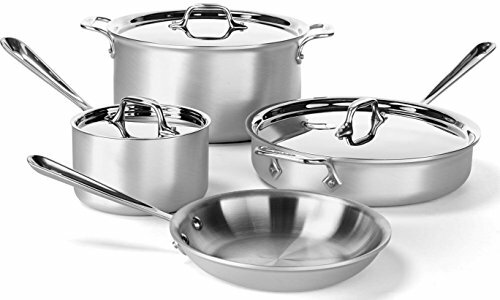 The All-Clad D5 range is similar to the MC2 range in terms of the kinds of items it includes, and the fact that they’re both a stainless steel/aluminum combo. However, the D5 range is more comprehensive and includes more pieces which the MC2 range doesn’t include. The D5 range is a few steps up from the MC2 range in price and construction. That’s not to say that the MC2 range isn’t as good, but it’s just a little more affordable due to fewer metal layers. Is all clad MC2 oven safe? Yes! Absolutely. You can use all MC2 pieces (lids included) in the oven up to 500 degrees Fahrenheit. The MC2 non-stick cookware items are oven-safe up to 400 degrees Fahrenheit. This feature is crucial for all kinds of dishes and purposes: keeping dishes warm, giving one last blast of heat under the broiler, or slow cooking dishes for soft and tender meat. What Is A Spice Kitchen? Why Are Dutch Ovens So Expensive? In order receive some payment for the costs associated with running this website, Alice’s Kitchen is a participant in the Amazon Services LLC Associates Program, an affiliate advertising program designed to provide a means for sites to earn advertising fees by advertising and linking to Amazon stores worldwide.